Chapel Hill municipal digital metered parking can be found on East Franklin Street. 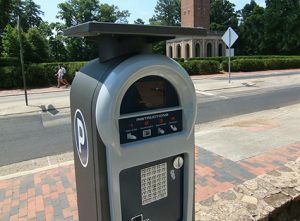 Chapel Hill stations allow payment by space number entry. The maximum time allowed for metered parking ranges from 3 to 10 hours ($1.75/hr). Spaces are activated Monday through Saturday, from 8:00 a.m. – 6:00 p.m. Parking is free after 6 p.m. and all day Sunday. Spaces may be restricted during holidays or Chapel Hill/University event operations. Alternatively, the University uses Digital Meter Stations, which operate from 7:30 a.m. – 9:00 p.m. Stations will allow payment either by license plate or space number entry ($1.75/hr). The nearest stations are on Raleigh Street, just south of Franklin. West Rosemary Parking Lot: 104 W. Rosemary St. This lot offers 18 metered spaces for visitors. Spaces are activated from 8:00 a.m. – 8:00 p.m. at a rate of $1.50/hr. This lot has a maximum parking time of 10 consecutive hours. Rosemary/Columbia Lot: 100 E. Rosemary St. This lot offers 102 hourly parking spots, including 4 handicaps spots. Spaces are activated from 7:30 a.m. – 1:00 a.m. at a rate of $1.50/hr. This lot offers the first 15 minutes of parking free and a daily maximum charge of $29.00. There is an additional peak period charge of $2.00 if the vehicle is parked before 10:00 a.m. and departs after 2:00 p.m. on weekdays. Wallace Deck and Public Plaza: 150 E. Rosemary St. This covered multi-level garage offers 243 hourly spots, including 5 handicap spots. Spaces are activated from 7:30 a.m. – 11:00 p.m. at a rate of $1.00/hr with a $17.00 daily maximum charge. There is an additional peak period charge of $2.00 if the vehicle is parked before 10:00 a.m. and departs after 2:00 p.m. on weekdays. Additionally, there is a weekend evening rate of a $5.00 nightly maximum charge between 8:00 p.m. and 1:00 a.m.
Morehead Lot: 250 E. Franklin St. Available sometimes. The Morehead Lot is located to the east of the sundial in front of Morehead Planetarium. The hours are posted at the entrance of the lot and overnight parking is not permitted. Visitors can park paying the hourly rates ($1.50) when the lot is not reserved for University events.